The Airman Battle Uniform (ABU) is a U.S. camouflage combat uniform; it is a service-distinctive uniform as it is primarily used by the United States Air Force, its civilian auxiliary, and some civilian employees of the U.S. Department of Defense (DoD). It replaced the Battle Dress Uniform on 1 November 2011 after a four-year phase-in period. On 14 May 2018, The U.S. Air Force announced that all airmen will transition from the Airman Battle Uniform to the Army Combat Uniform Operational Camouflage Pattern (OCP), which the Air Force refers to as simply Operational Camouflage Pattern. All airmen will be allowed to wear OCP-patterned ACUs beginning on 1 October 2018, and the wear out date for the ABU is 1 April 2021. The ABU showing effect of washing with detergent containing optical brighteners. The first prototype of the ABU was unveiled in the summer of 2003, based on the Vietnam War-era Tigerstripe pattern. The early uniform prototypes consisted of trousers, an embroidered undershirt, and a blouse. The camouflage pattern, developed by Tiger Stripe Products and based upon their popular copyrighted Original Vietnam Tiger Stripe, was a blue/gray, tiger stripe pattern. After months of "wear testing", Air Force officials revised the color scheme and camouflage pattern due to feedback received from airmen. The new elementary semi-pixelated tiger pattern would trade its dominant blue overtones for a more subdued palette, which still includes some blue tones. However, few of the functional recommendations made by airmen in the field were implemented into the uniform which remains very similar in design to the older BDU style uniforms. This has been a subject of many complaints from airmen returning from duty in Iraq and Afghanistan who had been wearing the Army Combat Uniform (ACU) as a temporary issue uniform. These complaints include the ABU's inability to keep the wearer cool while working in desert conditions due to the thickness of the material (13 ounces) and large interior "map" pockets, lack of storage space and the low ease of use with government issue personal body armor. While not officially recommended, airmen can cut the pockets out of the inside of the blouse because it does not alter the outer appearance of the uniform. On 2 October 2007, the Air Force began issuing the ABU to enlisted trainees in Basic Military Training at Lackland AFB and was issued to the Class of 2012 at the United States Air Force Academy on 26 June 2008, and is now available for purchase by all airmen. Since 2008, it has been issued to airmen deploying to locations in CENTCOM, including Kuwait, Iraq, and Afghanistan. Personnel in other countries were issued DCU uniforms while inventory lasted. The ABU is available at Army and Air Force Exchange Service (AAFES) military clothing stores. Although the Air Force has officially recognized color variations in different set of ABUs, all variations are currently authorized to wear and the problem should be fixed when the patterns are finalized within a year. Starting in 2009, airmen who were deployed or training for deployment were issued the new Airman Battle Shirt (ABS). The ABS was developed by Massif Mountain Gear and based on the Army Combat Shirt (ACS). Like the ACS, the ABS is a stand-alone shirt designed specifically for use with Improved Outer Tactical Vest armor in warm and hot weather. It is intended to greatly increase user comfort through the use of lightweight, moisture-wicking, and breathable fabrics. Since it is only issued to deployed or predeployed airmen, the ABS is not authorized for wear outside of the deployed setting. The ABS features the same tiger stripe pattern on the sleeves as the ABU features. In 2010, MultiCam was authorized to replace the ABU-pattern on the Airman Battle System-Ground in the War in Afghanistan by Air Force ground forces. In June 2011, The Air Force Times released the announcement of a summer weight ABU to be available in 2012. The Improved Airman Battle Uniform will be made of a 50–50 nylon-cotton blend and is the same material used by the Army for the ACU. Just like the ABU, the IABU is machine washable and also wrinkle resistant. Chief of Staff of the Air Force Gen. Norton A. Schwartz gave approval of the IABU coat and pants which will be available to trainees at Basic Military Training first. No special allowance will be given to troops since they are not being forced to buy the uniform, although it will cost about the same as the current ABU. The ABU became mandatory (completely replacing the BDU and DCU) on 1 Oct 2011, marking the beginning of fiscal year 2012, though most airmen had been wearing the ABU for several years by that point. 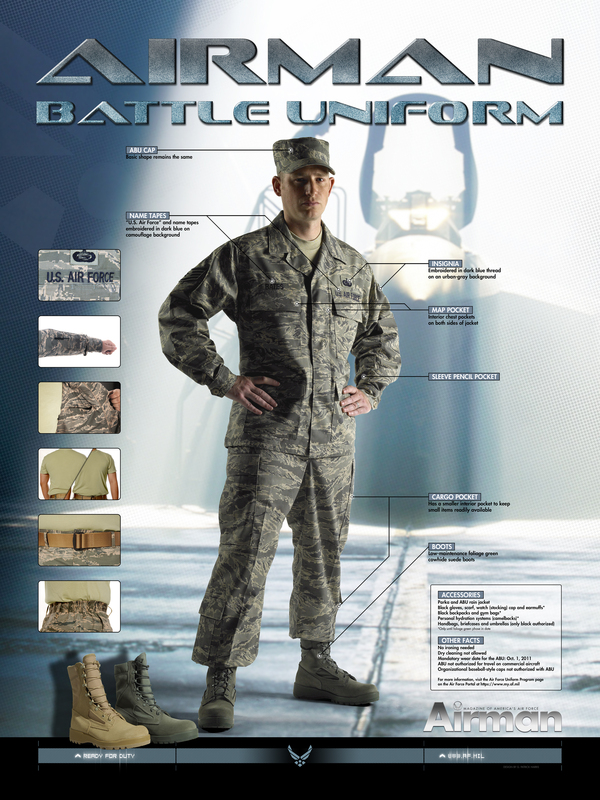 In May 2012, the Air Force changed the terminology of the new ABU uniforms to RABU (Rip-stop Airman Battle Uniform). The Air Force's civilian auxiliary, Civil Air Patrol, wear-tested the ABU in late 2015. In May 2016, the national commander of the Civil Air Patrol issued a memorandum allowing the wear of the ABU effective June 15, 2016. However, the uniform is worn with dark blue name tapes (with white lettering) and insignia cloth (similar to those used by the USAF in the 1970s) and black boots in order to distinguish CAP personnel. All Airmen have been authorized to wear the Operation Camouflage Pattern instead of ABUs since 1 October 2018. Recruits in basic training and cadets in Air Force Reserve Officer Training Corps, and Officer Training School will start being issued OCPs on 1 October 2019. The Airman Battle Uniform will no longer be authorized to wear after 1 April 2021. The Airman Battle Uniform is similar to the Universal Camouflage Pattern (UCP) in color, with the inclusion of slate blue, but is otherwise nearly identical to the BDU layout. The ABU is to be worn with low-maintenance sage green suede combat boots. The ABU does not have features of the U.S. Army ACU, such as tilted/slanted pockets, sleeve pockets, hook-and-loop attachment points and closures, gusseted back, mandarin collar, etc. However, the ABU does have essential NIR (near-infra red) qualities. The sleeves are authorized to be rolled up. The heavy weight of the material, along with the multiple layers used to make the interior pockets, retains more heat than the ACU or BDU in hot climates such as the Middle East. A new version of the ABU blouse has the multiple layers and inside pockets removed. Patrol cap's shape remains the same, including sewn vent holes instead of grommetted vent hole. Boonie cover is available for the ABU for use only in deployed locations. Sage-green watch cap for cold climate garrison and deployed locations with the All Purpose Environmental Clothing System (APECS) parka. The Army's sage-green ACU fleece watch cap was authorized in 2010. Organizational T-shirts are authorized for wear on Fridays as a morale booster, but are subject to command level discretion. The change came with a revision of AFI36-2903 in 2014. All insignia, including occupational badges (aeronautical wings, occupational badges, etc. ), are embroidered in midnight-blue thread with urban-gray background with the exception of rank insignia for 2nd Lieutenant and Major, which incorporate brown thread. Name and service tapes are embroidered in midnight-blue thread on ABU background tapes. Patches (e.g., MAJCOM, wing, group, squadron, etc.) are not worn with the ABU, with the exception of aeronautical and chaplain badges and duty shields for Security Forces and Fire Protection; however, occupational badges (up to 3) are authorized and encouraged. 2 internal map pockets (allowed to be removed and no longer a feature in current production runs). Pen pocket on left forearm (holds two pens). No other patches are authorized – except the Commander's badge. The sage-green fleece jacket is now authorized as an outer garment. Boots are available from a number of manufacturers (Belleville, Corcoran, Bates, Danner, Rocky, Converse, Rockport, etc.). Sock color must match boots. The ABU comes in 236 different size options in both male and female sizes which are only offered in temperate weight. Additionally, its permanent press finish means the uniform cannot be starched, pressed or dry-cleaned. Airmen are able to pull the ABU from the dryer and wear it without further treatment. Any further treatment would degrade the effectiveness of the uniform and damage the NIR capability. No mixing of camouflage patterns is currently authorized with the ABU except when in deployed locations such as the U.S. Central Command (USCENTCOM) Area of Responsibility (AOR), or when ACU or camouflage field items, such as magazine/utility pouches, personal body armor, helmet covers, knee/elbow pads, etc., are authorized. Exception to this policy is the ECWCS Gore-Tex parka which, with installation commander approval, is authorized for wear with the ABU. Only the AF APECS Parka or DCU Gore-Tex is authorized in the USCENTCOM AOR. Backpacks and other accessories must be sage, black, or ABU pattern. As many accessories are not made in ABU specifically, ACU pattern accessories are authorized. Despite improvements to the uniform such as wash and wear fabrics and improved NIR coverage, the uniform still has known problems. One of the most common complaints is that the uniform is too hot for wear in high temperature environments. In 2008, responding to these criticisms that the new Airman Battle Uniform was too heavy and hot, the USAF's 648th Aeronautical Systems Squadron at Brooks City-Base revealed their plans for a switch to a lighter, more breathable fabric with the combat blouse section of the ABU. The original heavyweight nylon/cotton blend was changed to a lighter-weight nylon/cotton poplin material. Priority will go to those serving in the Middle East or other hot-weather theaters. Additionally, the uniform has been criticized for failing to incorporate any but the most superficial features designed into the ACU and MCCUU. The semi-digitized, tiger-stripe pattern has been criticized for being ineffective and unrealistic. These issues were addressed in an open letter from the pattern developer, Tiger Stripe Products, to servicemembers of the USAF, in which the developer agreed with the criticisms, but blamed the Air Force leadership for them. As of 1 February 2012, the ABU is no longer authorized within Afghanistan, though still used by a few airmen. To have uniformity with the U.S. Army and U.S. Navy, and seeing the need to better blend with the landscape and provide a lighter & cooler uniform for the desert environment, the Air Force approved and adopted the wear of the Operation Enduring Freedom Camouflage Pattern (OCP), or Multicam, when on deployment to Afghanistan. The ABU is still worn outside of Afghanistan, as Multicam has only recently been authorized for outside Afghanistan operations. Some AFSOC and ACC units were the first to begin utilizing the Multicam/Scorpion W2 uniform in-garrison as well under local commanders' policies, and AFCENTCOM officially rechristened the uniform the "Airman Combat Uniform" in an August 2017 supplement to AFI 36-2903 Dress and Appearance. In spring of 2018, it was announced that the Airman Combat Uniform would replace the ABU and was authorized for all Airmen beginning 1 October 2018. Ukraine: Used by Chernihiv Company, Ternopil Company and Kyiv Regiment. ^ Formally; limited prototype testing from 2006 to 2007. Used alongside the Battle Dress Uniform (BDU) until 2011. To be discontinued altogether in 2021. ^ a b Cox, Matthew (14 May 2018). "Air Force transitions to a single combat uniform". AF.mil. ^ "Optical brightners make ABUs dangerously easy to see". Vandenberg Air Force Base. 24 August 2007. ^ Bruce Rolfsen. "Airmen will receive MultiCam, eventually". Army Times Publishing Company. Retrieved 13 September 2010. ^ Lighter ABUs to help Airmen to beat heat in 2012, (2011). "" ^ Air Force Link, (2006). "Airman Battle Uniform finalized, ready for production"
^ "U.S. Air Force - Mobile"
^ "ABUs - CAP Talk, the unofficial Civil Air Patrol forum". captalk.net. ^ Mancaso, Shon J. (13 July 2018). Dress and Personal Appearance of Air Force Personnel (PDF) (Report). Department of the Air Force. p. 9 of PDF. ^ "Sleeves can now be rolled up". ^ Air Force Link Airman Roll Call 2007. U.S. Air Force - Mobile Archived 12 December 2007 at the Wayback MachineRetrieved 30 November 2007. ^ "AFCENT Updates Dress And Appearance Instruction; Does This Signal Changes Coming Air Force-Wide?". Soldier Systems. Retrieved 6 September 2017. ^ "It's Official: The Air Force Is Switching to the Army's OCP Uniform". 14 May 2018. ^ "Pentagon spends billions on duplicative camouflage outfits, GAO says". ^ "DoD civilian finally gets to deploy". US Air Forces Central Command. ^ "Ternopil Company - Military Land". Wikimedia Commons has media related to Airman Battle Uniform. This page was last edited on 11 March 2019, at 07:54 (UTC).